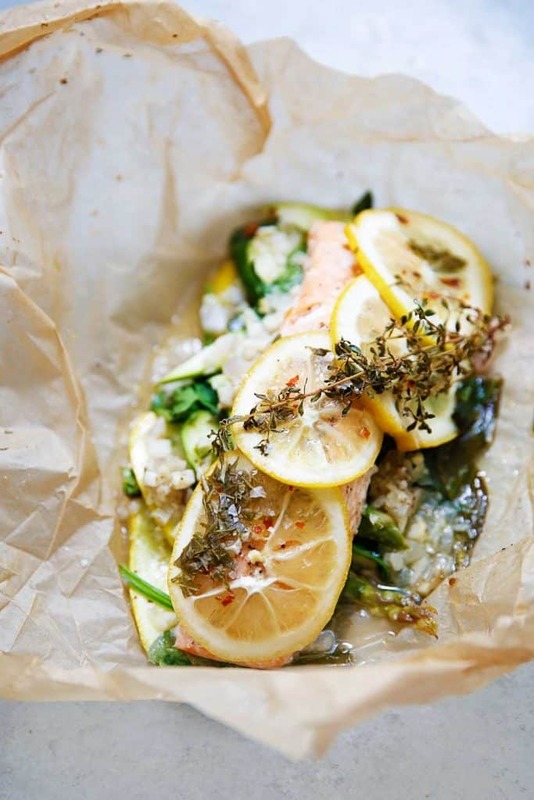 This Salmon En Papillate (Baked in Parchment Paper) is my new favorite way to prepare salmon. It’s a super simple, Whole30-compliant, and paleo-friendly dinner option for any night of the week! The lemon, fresh herbs and shallots make this salmon such a bright, light and flavorful salmon recipe, and the vegetables cook right with the fish for an easy clean up! I like the idea of foil pack meals, but I’m not super into wrapping my food in aluminum foil! Parchment to the rescue! 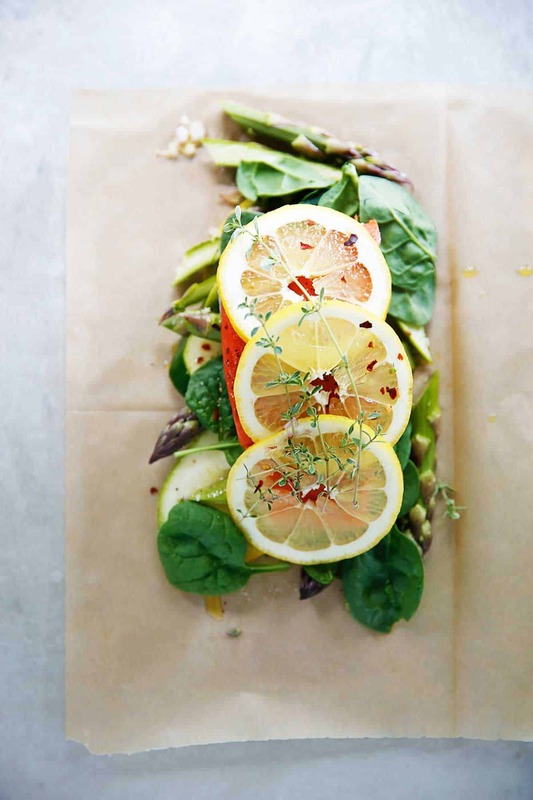 Place all the goodness in your sheets of parchment: salmon, veggies, aromatics, and fresh herbs. MMMM… look at that goodness ready to bake! You are then left with a fabulous, flavorful, and cooked-just-right salmon dish! Plus, the veggies are done, too! Easy weeknight dinner alert. What is fish en papillote? En papillote (French for “in parchment”) is a method of cooking in which the food is put into a folded pouch or parcel and then baked. Like this recipe? Try these other seafood dishes! Preheat oven to 400 degrees. Divide spinach among four 16-inch-long pieces of parchment paper. In a small mixing bowl, toss asparagus, zucchini and summer squash with salt, pepper, garlic powder, and extra-virgin olive oil. Divide tossed veggies evenly among the four pieces of parchment paper with the spinach. Pat salmon dry. Season with salt and pepper. Top with shallots, garlic, fresh herbs, and lemon slices. Bring ends of paper together and fold down the edges around the salmon until a sealed packet has formed (watch the video above for steps!). Make sure to tuck ends underneath to secure. Place salmon packets on a baking sheet and bake until packets are puffed and salmon is cooked through about 15-18 minutes. 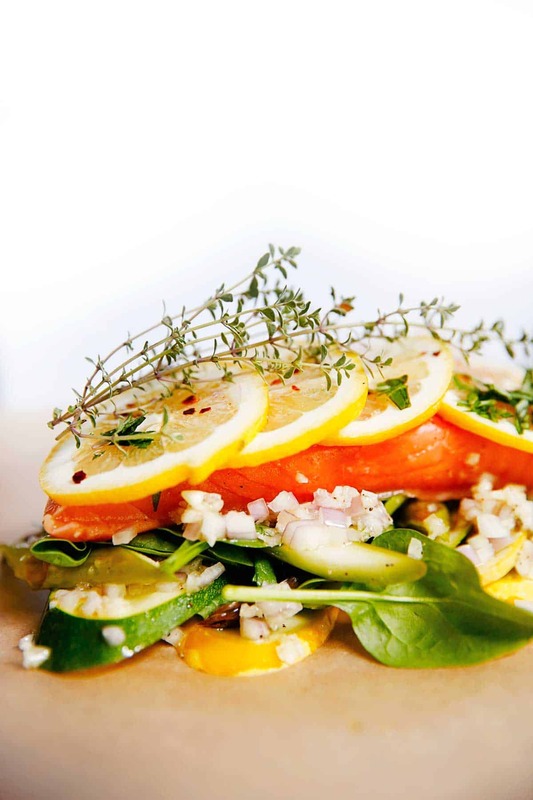 These are SO beautiful and I love the way that parchment cooks salmon- delicious! I just love cooking in parchment! Everything stays so moist. And hey, less dishes! Win win! Oh i love recipes like this! Especially salmon packs. So flavorful and easy to clean up. The fish always comes out so flaky and moist!! So easy, so pretty, SO yummy!! My mom HATES salmon, but I cook it anyway and make her eat it because it is good for her. I made this dish tonight, all the time worried she would hate it because it was lightly seasoned. Y’ALL she ate every bite and kept saying how much she loved it!!!! The veggies were al denté and so delicious. My dad went back for seconds! This will be on a regular rotation for us. This was my first time making fish in a parchment paper pouch. I have to say it took me a moment to get the hang of how to close it, but eventually I got it to stay. The prep was so easy and the fish came out perfect! My husband said this was the best salmon I ever made! !